This is an exercise that I wrote about back in 2000, and I thought I would dust it off and republish it. You probably don’t want to place anything precious or costly in them. You can’t include items that belong to another family member or that you are currently using. Over the years, you have probably misplaced or given away some excellent candidates for the capsule. Some items are just too big! So, how about creating a paper time capsule? Make a list of 10–12 items from your life that evoke memories. You don’t have to currently possess each item. Take some time to think about this. Choose items from different time periods—childhood, teenage years, early adulthood, etc. Try to span your entire life. For some, this is not as easy as it sounds. When I started my list, I had a hard time coming up with objects. By the time I got to the end of my list, I couldn’t stop thinking of them! Some suggestions for items to include are: toys, mementos, certificates and diplomas, works of art, tools, kitchen gadgets, articles of clothing, crafts, journals, and pets. It is important to limit the number of items before you begin listing them. This ensures that you think carefully about the value or importance of each thing you include. If you find yourself listing too many items, it is okay to go back and replace a previously listed item. Don’t bother to list them in any special order—just get them down. Here are some examples from my list: and old pipe I bought in Israel, an aquamarine ring, dirndl (dress) from Salzburg, Girl Scout sash, lock of hair, pink sand from Utah. How did you come to possess it? Who gave it to you? Why did you acquire it? Where did you live when you owned it? Did someone else possess it with you? Who and why? Do you still have it? Is it something you hope to pass on to another family member? Why did you select it to include in this “time capsule on paper?” Why was/is it special to you? If you no longer have it, do you have a photograph or sketch of it? Write a notation, description, history, or story about each item. Don’t try to write all these memories in one sitting—it will be overwhelming. Describing one item a day or week is plenty. Our memoir writing group spent several weeks working on our paper time capsules. For the first week, we each made a list and wrote about one item. Just reading the lists to each other was inspiring, but when we read our stories, WOW! Sally’s story of a family footstool brought tears to our eyes. Now start your paper time capsule. When you are finished, seal it away with instructions about when and by whom it is to be opened. The great thing about this kind of time capsule is that you can make several copies—one for each grandchild, for example! Make a list of fifty-two items and write about one each week for the next year. Ask another family member or friend to write or otherwise record their remembrances of some of the items on your list. Go further—put together a family paper time capsule. Ask each family member to “contribute” three or four items. If they do not want to write about them, get them to record their memories on audio tape, which you can later transcribe. Bind your memories: a time capsule in a book! Facilitating a Lifewriting Group is Easy is available for purchase in both a hardcopy (printed) form and as an instant download (e-Book) at my Capturing Memories Store. Visit the store to freely download the Introduction, Table of Contents and Chapter One. This is one of the exercises that I have used in lifewriting groups that always kindles many stories. Note for lifewriting group facilitators: If you are using this activity for a group writing exercise, ask everyone to bring in 4–6 personal photos for this session. The photos should represent different times in their lives—childhood, young adulthood, parenthood, etc. It is preferred that they not bring professional portrait photographs. The most useful images for this activity are the ones with lots of “stuff” in the background—like their homes, automobiles, or other possessions. See below for link to a free downloadable .pdf version of this activity that can be used as a handout. Choose a photo from your past that has some familiar objects in the background: a car you remember, a neighbor’s house, the fence you helped your Dad build, or the sandbox you played in. You get the idea. Write down who each person was. How were they related? What was each person doing? Did they want their photo taken? Do you know who took the photo? Why did they? If you don’t know why, speculate. All homes had screen doors. No air-conditioning in South Texas then! Washer/dryer was in one unit. We could see fire through a hole in it. Mom sprinkled her clothes before ironing. Back porch was the coolest place in the summer; large ceiling fan; we played endless games of Monopoly there. Venetian blinds were hard to clean. We never ate bananas from that tree. In this case, the memories that the photo inspired seem to have nothing to do with the photograph. That really does not matter. A memory has been kindled. A story has been written. A printer-friendly .pdf version may be freely downloaded here. Step 5: Using your theme as a guide, make a list of potential contributors. Start with your steering committee. Send each member a worksheet (see the example below) in advance of an early committee meeting. Ask that they make a list of potential participants, including contact information and a bit about their background in the community or organization. Senior center: Offer to do a presentation about your project at your local senior center or retirement community. Prepare an announcement to be published in their newsletter. High school alumni: Ask if you can set up a table or display about the project at high school reunions. Local churches: You may be able to include an announcement in church newsletters. Participants themselves. Even after the project is underway, you will probably receive suggestions for other participants from those who have already received their workbooks. Don’t forget to include people who have moved away but still have ties to the local community or organization. Step 6: Create a workbook for contributors to complete. An inspirational workbook is one of the key ingredients of a successful Memory Book project. When a potential contributor receives his workbook, you want him be excited and eager to send his stories to you. You also want the process to be as simple as possible. When a workbook is designed well with sharp images, clear, open-ended questions, and plenty of white space for writing, it is easier and more enjoyable for your participants to write their stories. Many participants will continue to add to their workbooks even after the project is completed. You need only a handful of photos or other illustrations for the workbook. The best illustrations for the workbook are those which help contributors recall specific places, events, or people. In the workbook sample page at the right is a photo of a well-known lifeguard and swimming teacher in the community. We received so many stories about him that we made a separate chapter just about him in our final book. An introduction, including a clear explanation of the project. Release Forms: Get signed releases from participants to use their stories, photos, and other images, not only in the memory book, but also in future research, exhibits, broadcast, publication, or museum publicity. You cannot legally use any of their stories or images in publications or exhibits without these releases. Step 7: Collect the stories and images. When you send out the workbooks, do not give contributors too much time to complete them. You don’t want the books to be buried in a “to do” pile. Four to six weeks should be adequate. One to two weeks before the deadline, follow up with phone calls to those who have not turned in their workbooks. Remember, not all of your workbooks will be returned. Expect 20–30 percent of them to be returned, and then if you get 40–50 percent back, you will be delighted. Follow-up mailings and participant gatherings will increase the return rate. Step 8: Create your Memory Book publication, exhibit, or other end product. Once you begin receiving workbooks, you can begin the process of creating your Memory Book. This can be the most rewarding and fun part of the project, but it can also be the most challenging. In all the Memory Books I have worked on, there has been an overabundance of material to include—and not enough funds available to publish it all. You must make judicious choices of stories and images—include something from each contributor and choose stories that are varied and interesting. Leave plenty of room for eye-catching images, but don’t turn it into a “coffee-table” book of mostly photos and few stories. Fitting the themes and scope of the project. Personal recollections of well-known community/organization/family events. A mix of humorous stories, touching stories, coming-of-age stories (if appropriate to the theme), sad stories, inspirational stories. Make an attempt to use at least one entry from each contributor. This encourages more participation in future projects. Consider taking the time to include a bio from each contributor in the back of the book. The Fall City Historical Society (Washington) even included a small portrait of each person next to their bio—a nice touch and one that family members and researchers will appreciate. An oversized exhibit version of the book displayed in the museum. To celebrate and publicize the publication of your book, invite some of the contributors to read their stories at a public reading. If you do not have a meeting space, ask your local library if you can use their meeting room. Be sure to have plenty of copies of the book available to sell! purchased in the Capturing Memories Store. Today and in my next post, I am sharing the basic steps for conducting a Memory Book Project and I will include a few ”tips for success” along the way. In the project director’s guide Memory Book Projects each of these steps has an entire chapter devoted to it which provides lots of details for making your project a successful one. Step 1: Determine the theme and scope of your project. If you are collecting stories for a widespread community or organization, it will be necessary to narrow the subject. In the first Memory Book project we worked on with the Long-Timers group of the Southwest Seattle Historical Society, we initially entitled the project “Memories of West Seattle.” Once stories started coming in, we realized that the scope of the project was too broad. Since we did not have the funds available to publish so much material, we narrowed the topic to only include the Alki neighborhood of West Seattle in the final publication. That was where the bulk of contributions came from. It was a difficult decision to make in the middle of the project, because we were concerned that some of the contributors who lived outside the Alki neighborhood would be offended. Fortunately, we were able to later utilize most of the omitted stories in a museum exhibit, 47 Voices Remember. You walk a fine line between too broad a topic and one that is too narrow. If you choose a limited subject with little potential, you will be scrambling to collect enough material to make a book possible. While you are considering topics, keep in mind the number of potential contributors. The more contributors you will have, the narrower your topic should be, and vice versa. Step 2: Form a Memory Book steering committee. Recruit volunteers to transcribe, write captions to images, assist elders in completing their workbooks, editing and proofreading, etc. Step 3: Determine the project budget and locate funding sources. Before beginning any fundraising, it is important to have a good idea of what your project is going to cost. Include some contingency funds as well, in case your project outgrows your initial plans. In two Memory Book Projects we worked on, the number of stories and images that were collected far exceeded our original projection. The projects were almost too successful. Even after careful selection and editing, publication costs were more than we had planned. Fortunately, in both cases, contingency funds were available so that we were able to increase the number of published pages. It would have been disappointing to have eliminated some of the remarkable stories we collected just for lack of funds. Step 4: Set up the project schedule. The time required to complete your project depends on a number of factors. The first is funding. If you are applying for a grant, you may have to begin planning a year or more before completion of the project, depending on the grantmaker’s schedule. If it is important for the project be completed by a certain date (to coincide with an annual community celebration or reunion, for example), you should add at least an extra month to the schedule. Don’t box yourself in. The last month of the project is the most intense. If any part of the schedule slips, you will need to move the publication date back—or plan to spend some very stressful late nights during the last two weeks of the project. Believe me, I speak from experience when I say that this is not the most fun way to celebrate the end of a wonderful Memory Book Project. 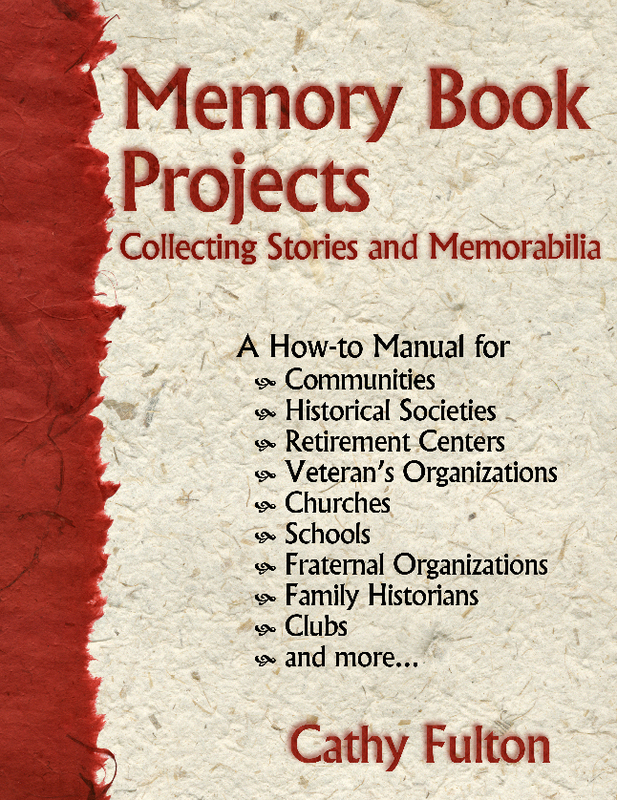 In the meantime, you can freely download the Table of Contents, Introduction, and Chapter 1 of Memory Book Projects, Collecting Stories and Memorabilia in the Capturing Memories Store. Once I was convinced that there was a need in the community for a second writing group in the evenings, I put together a list of topics that I would feel comfortable presenting to the group. I chose ideas that I had used to stimulate my own writing. Remember, I only had to lead a discussion for 10-15 minutes on each one. Other people join the discussion so I rarely talk for 10 minutes. It is not so much of a lesson as a discussion of technique. I got my ideas from reading books on memoir writing. Joyce Delbridge very generously made suggestions and allowed me to use her ideas and handouts. Since I did not want to charge for the “workshops” as I have come to call them, I needed to find a meeting place that would not charge for its use. I though this would be the hardest part, but it wasn’t. I happened to mention that I needed a meeting place to a friend of mine who was also one of the assistants at the Family History Center where I do my genealogical research. (These centers are located in Mormon (Church of Jesus Christ of Latter Day Saints) churches throughout the world.) She suggested that we meet at their church. She even arranged the room for me through the church organization As it turned out, one of the criteria for using their facility was that I couldn’t charge for the meetings! (I can, however, be reimbursed for copying costs of handouts.) It was just what I needed. Besides, it was a perfect location since genealogical research and family history writing go hand in hand. Other excellent locations for lifewriting groups are senior centers and libraries. I created a simple poster to put up around town and wrote some short newspaper announcements. Before I knew it, I was printing out handouts for my first meeting. Since I did not require registration, I had no idea of how many people would be at the first meeting. The group turned out to have 11 members. A great beginning! If I had had more than 20 people show up, I would have seriously considered breaking it into two groups so everyone who would want to read would have an opportunity. about 10 minutes getting settled. about 30 minutes sharing stories and commenting on them. 10 to 15 minutes discussing the evening's topic. the remainder of the time sharing more readings. Anyone who wants to read draws a number from a bowl. This determines the order in which we read. After only three meetings I felt that our group was a great success! People shared delightful stories about themselves and their ancestors. Some were humorous, some serious, some heart-rending, but all the stories were listened to with rapt attention. Comments from group members were helpful and encouraging. It was obvious that everyone was enjoying the workshops. I sure was. The amount of effort I expended in starting the workshops was really negligible when I consider how much inspiration I am getting from the group. My family history writing had been waning during the year I had not been a part of a writing group. Now I was inspired to write again. It is a great joy to listen to the stories others have to share and I continued to get ideas from my fellow writers. 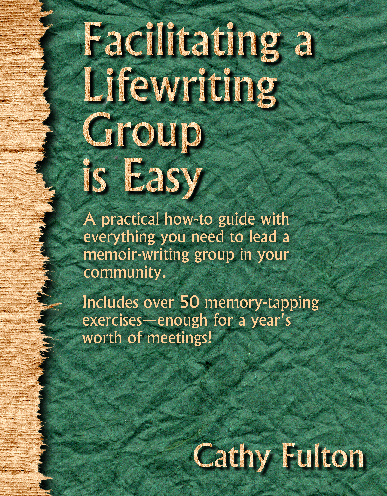 Cathy Fulton is the author of Facilitating a Lifewritng Group is Easy,which is packed with memory-kindlingideas and worksheets for any memoir writing\group. Find it in the Capturing Memories store, where you can download a free copy of the Table of Contents, Introduction, and Chapter 1. One of the purposes of my lifewriting workshops is to inspire people to write. The place where I have found the most inspiration was in a memoir writing group. Our local Senior Center has had a writing group going for over 10 years. Periodically they present public readings of their best work. I attended one of those readings and immediately wanted to join them. I called the Senior Center and asked if I had to be a senior citizen to take part (I was only 40 at the time!). I was assured that I could join. Find it in the Capturing Memories store. I was a part of that group for two years. It met every week on Monday mornings. I wrote lots of stories and even published a book of stories about my Father. I wanted to keep attending, but I had two young children and found it difficult to find child care for them on Monday mornings. So, I had to stop attending the group. Shortly afterward, my writing decreased. I wasn’t getting my weekly inspirational fix. I missed the group terribly. Joyce Delbridge, our group leader, encouraged me to start my own group. Who me? I could never “lead” a writing group. After all, I had only been an average writer in school. Yes, after 20 years, the stigma of all those compositions returned to me “bleeding” with red ink, was still there. My friends and family told me I was a good writer, but I didn’t really believe them. My composition grades 20 years ago were a strong reminder that I wasn’t. However, I wanted to be a part of a writing group. If it could be held in the evenings, I could attend. Over the course of a year, I occasionally talked to other people who would be interested. I started working on my family history at the local LDS genealogy center. I met more people who were potential family history writers. Finally I decided to take the plunge. I would start a group to meet in the evenings so working people could attend. By now, I had done enough reading on the subject to realize that this would not be a class in writing compositions. Our objective would be to get our family stories down on paper—nothing more. No cost—except the nominal membership at the Senior Center ($8.00/year) and cost of copying handouts. No guilt. Don’t worry if you can’t attend every meeting or write something every week. No writing “assignments.” Write what you are inspired to write. Share your stories with the group only if you wish to. Meet once a week, except during holidays and the summer. Most of the meeting time is spent listening to readings and commenting on them—not critiquing. (Keep the meetings positive.) We didn’t worry about grammar or sentence structure. Our comments were mostly along the lines of “I liked the part about…” or “Could you tell us more about…” The closest we came to negative comments was “I didn’t understand who was talking when…” or “Can you explain what happened there at the beginning…?” or something along those lines. Spend 15 to 20 minutes discussing a specific topic, like where to get inspiration, how to organize stories, how to write dialogue, etc. “Research has shown that the act of telling your life story increases self-esteem, reduces depression, alleviates loneliness and helps people deal with grief and loss,” says John Kunz, manager of the International Institute for Reminiscence and Life Review at the University of Wisconsin-Superior. Every January, at the beginning of the new year, interest in memoirs and family histories gains a resurgence. The “baby boomers,” those people born between 1946 and 1964, are now reaching their late middle-age years. They are becoming grandparents and beginning to review their own lives. The urge is strong to record our stories and pass them down to our decendents. I will post details about these two books the next few posts.